A gold charm hangs from the hand of the angel as she floats in front of the moon. Her gown is draped and swirled in shades of blue and mauve. Gold beads scatter in her path. 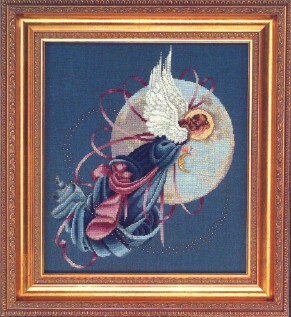 Stitched on 32 count French Blue Linen (2 over 2) or 16 count French Blue Aida from Wichelt. Substitute Blue Spruce. Frame number 601 from Larson-Juhl. #2843 Moon Charm from Creative Beginnings.